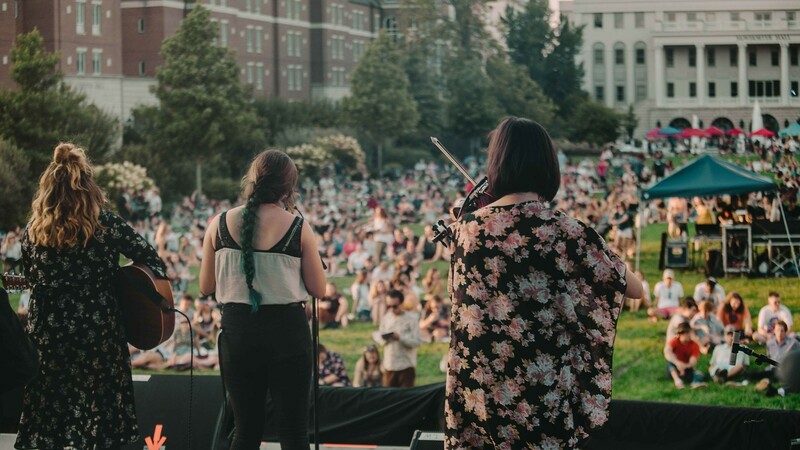 Belmont started the 2018-19 academic year with the fourth annual “Battle of the Belmont Bands and Family Fun Festival” on Saturday, a family-friendly music festival held on and around the Lawn. Alumni, faculty and staff brought their kids out to the patio in front of McWhorter Hall at 4:30 p.m. for activities that included face painting, balloon animals, illusionist performances and bouncing around in inflatable toys. Several alumni also participated in a vendor fair, bringing their books, food, clothing, jewelry and other crafts to campus. Live music kicked off on the main stage at 6 p.m. with a concert featuring exclusively student and alumni talent. The annual “Battle of the Belmont Bands” contest, put together as part of the Curb College of Entertainment and Music Business’ Showcase Series, allowed student bands to compete in front of a panel of industry experts in the audience to determine a winner. Those judges are organized by Musician’s Corner, the annual concert series in Centennial Park to promote emerging artists, which then invites the winner to perform at an upcoming concert. Student bands participating included Andrew Douglas, Grace Gonzalez, McCall & Katareen, Patrick Murphy, Slurp and No Coast, which was deemed the evening’s winner. The event concluded with a headlining performance from alumni group Dynamo, a nationally touring band whose music fuses jazz, rock and funk with elements of soul and R&B. Click here to see additional photos from this year’s event.